Turn down the heat in winter. ⦁ The US Department of Energy reports that every degree lower you set your thermostat for a period of at least eight hours (while sleeping or at work) can reduce your heating bill by 1%. This doesn’t mean you have to freeze at night. Try throwing on warmer pajamas or snuggling under an extra blanket. Programmable thermostats control temperature all day, every day. ⦁ Save up to 30% on energy bills by covering drafty windows and doors, and by sealing air leaks. One easy and cheap way to stop a draft is placing a rolled-up towel at the draft site. Temporarily cover windows with plastic to help. Drafts can also affect the thermostat reading. Dirty filters can restrict airflow, making systems work harder, which in turn increases bills. Filters should be cleaned or replaced monthly during the cold season for furnaces and hot weather for air conditioners. Filter maintenance can also reduce medical bills as more allergens and debris are caught and prevented from circulating and impacting health. Install energy-efficient windows and doors. Homes lose heating and cooling through outdated windows. Double-pane windows reduce thermal transfer with an insulating dead-air space between two panes. Single-pane windows can lose more heat in winter than they let in and then, in summer, allow in more heat. Changing direction of a ceiling fan can save as much as 10 percent on your heating. Good Housekeeping reports that turning the counterclockwise fan rotation that produces a cool breeze to a clockwise rotation pushes the warm air back into circulation. All major appliances need regular tune-ups to stay clean and properly adjusted so they run more efficiently and have longer service lives. Reduce the water heater setting. The standard hot water heater setting is 140 degrees Fahrenheit. 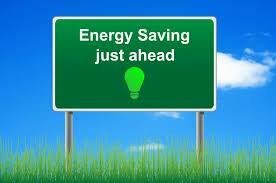 Lower energy costs 6-10% by changing to 120 degrees. Use weather stripping and caulk. Look for places where different types of building materials meet such as corners, chimneys, and around pipes and wires. Plug any gaps with caulk and weather stripping. Test for leaks by carrying a stick of incense around and noting where the smoke wafts. The U.S. Department of Energy cautions that roughly 20% of heated air can escape from your home ductwork. Have your ducts professionally checked to determine if sealing or other improvements can be helpful. There’s a cost to such repairs, but people save upward of $120 annually. Proper ductwork also defends against dust and mold. Sealing ducts is not the same as cleaning them. Actually, studies show that cleaning ductwork is often unnecessary if properly sealed and maintained. Weather stripping around doors and windows becomes worn and torn over time, creating drafts and allowing costly air exchange. Loss of warm or cool air, causes the furnace or air conditioner to work harder. Maintaining your weather stripping is a vital part of maintaining your overall system and your home. Replacing weather stripping is often as simple as pulling off the old and tacking on the new. Visible daylight under a door means lost indoor air you pay to heat or cool. Many thresholds use four or five screws to adjust the height and eliminate the gap. Turn screws counterclockwise to lift the threshold until daylight is mostly gone. Some light in corners is okay. Don’t raise the threshold so high that it makes opening and closing the door a problem that also increases wear on weather stripping. Eliminate drafts around electrical boxes. Electrical boxes in exterior walls tend to be drafty because insulation isn’t always placed correctly behind and around them. You need to stop air from flowing around and through the box. Remove the cover plates and fill small gaps with acrylic latex caulk. For large gaps, use foam sealant. Place a foam gasket over the outlet or switch and replace the cover plate. Plug holes in exterior walls. Any pipes, gas lines or electrical cables entering your house may have gaps around them left by imperfect caulking. Also, caulk eventually cracks, peels and falls off. These gaps let in outside air and are common entry points for vermin and insects. Even well-insulated attics may have issues if the access doors let air escape. If the door is warped or the opening obstructed the door won’t lie flat and air can leak into or out of the attic. Use adhesive to attach fiberglass “batt” insulation to the attic side of the door. If the door doesn’t lie flat, add a latch-bolt system to close it tight. Escaping heat and cold air in homes without proper insulation causes hundreds of thousands of dollars in energy costs each year. Even inexpensive insulation covering up areas where air might escape will help. Kitchen and bathroom exhaust fans pull air out of your home. Use such fans sparingly and shut them off when you are finished with them.